Wondering about things to do in Destin Florida for the 4th of July? Well the secret is out that the top spot is Crab Island, an underwater sandbar where locals and guests drop anchor with their boats for an unforgettable day in the sun. Only accessible by boat, Crab Island offers hours of fun in the crystal clear, waist deep waters – whether you want to relax on a float or listen to live music and jump on inflatables, it’s a playground of fun for everyone. Instead of dealing with the hassle of captaining your boat, let us take you to Crab Island. Our Crab Island cruises are soaring in popularity, as one of the top things to do in Destin Florida. But you don’t have to take our word for it. Check out our 5 star reviews on Facebook or our Yelp Reviews, that earned us the People Loves Us on Yelp Award for 2017. Let us take you to the only place to be this 4th of July – we’re cruising twice daily to Crab Island, including special 4th of July times. Also, check out our daily sunset dolphin cruises and Harbor Fireworks Cruises. What a great way to kick off summer with an award based on our guests’ reviews. There’s nothing more coveted than an award earned directly due to the reviews your guests have taken the time to leave. SunVenture Cruises is the proud recipient of the 2017 People Love Us on Yelp award – based on the numerous 5 star reviews left by our guests. Ande, Scott Depot, WV: “The guys on the boat were great. They were funny and eager to help you with anything. Bring your own alcohol. It is allowed, and if not the margaritas are $15.00. The guys from the boat will even give you your beer/fill your cup so you don’t have to climb up and down. They were great. The water at Crab Island was perfectly clear and this was probably our favorite day of our whole vacation. We will definitely do this again when we return to Destin, maybe even more than once. Book with us today and experience it for yourself. Crab Island is by far one of the most unique things to do in Destin Florida. Where else can you float, mingle and play in waist-deep, emerald green waters, go down inflatable slides, listen to live music and bask in the sun? It truly is something everyone has to experience. Cheaper than renting a boat to Crab Island – the cost of renting a pontoon boat and the gas will cost you much more than $40 per person for our Crab Island cruises. Not to mention – you might not have a bathroom on board. Safer than renting a boat – all our captains are Coast-Guard licensed and cruise twice daily thru the Destin Harbor to Crab Island. You will not find anyone more experienced with the Destin waters. No need to worry about navigating through the unpredictable boat traffic and figuring out where to anchor at Crab Island. Also if you decide to BYOB, you don’t have to worry about driving the boat, just having fun. More relaxing, convenient and fun than renting a boat – it’s no fun to have the hassle of driving, anchoring and caring for the boat while everyone is enjoying cocktails in the sun and taking in the scenery. Let our captains host you for the day – they anchor at Crab Island and stay with you the entire time. Bring your own cooler – Just when you thought the deal couldn’t get any sweeter – BYOB! Bring your own alcoholic or non-alcoholic beverages aboard the SunVenture at no additional cost. Bathroom on board – Did we mention that the Crab Island sandbar is out in the middle of the waters? The SunVenture stays anchored with you through the entire 3 hour excursion so you have complete access to the bathroom and your cooler. For even more reasons to cruise with us, read what our guests are saying about their Summer 2016 Crab Island experience. View our Crab Island cruise schedule and book online here. 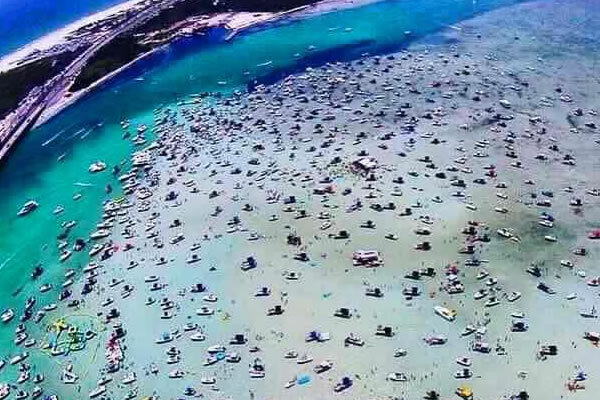 Ask any local and they will tell you that the one of the top things to do in Destin Florida for 4th of July is Crab Island. This underwater sandbar is a water-lovers paradise and is only accessible by boat. 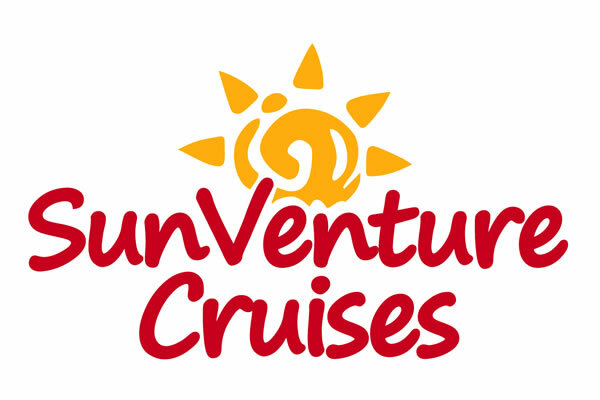 The SunVenture offers one of the only Crab Island cruises, cruising twice daily for a worry free day of fun in the sun. SunQuest Cruises is hosting the best celebrations for 4th of July in Destin Florida on the water – the best place to watch fireworks in Destin is on a boat of course! Offering the ultimate day and night experiences on the water, SunQuest Cruises offers everything from Crab Island excursions to Destin fireworks and dinner cruises. In addition to daily sunset dolphin cruises in Destin, the 45 foot, sporty, water lover’s SunVenture catamaran cruises the legendary Crab Island twice a day at 10am and 2 pm. 4th of July weekend in Destin there are special holiday Crab Island cruises on Saturday, Sunday and Mondayat 9 am and 2 pm as well as a special Fireworks Destin Harbor Adult Cruise at 7:30 pm. With picturesque views of the Destin bridge, Crab Island offers everything from live music and water slides to floating food vendors, paddle boarding and relaxing in the water. Crab Island is only accessible by boat. Let our captains take you to our 4th of July Crab Island Excursion at 11 am this Saturday. Family is what life is all about but sometimes it’s nice to spoil the adults. That’s why the SunVenture is offering adults only cruises every Thursday night and Monday, July 4th at 7:30 p.m. for an incredible fireworks show on the water. Venture aboard the SunVenture for a 1.5 hour narrated cruise that explores the beautiful Destin Harbor and ends with a BANG! Experience a magical night as the sky above you illuminates with a spectacular Destin fireworks show. View the daily cruise schedule here or call 850.424.6465. For an amazing night of dining on the water, consider our sister boat, the 125 foot SOLARIS yacht in Sandestin. The SOLARIS is hosting its annual 4th of July Fireworks, Dancing and Dinner Cruise in Destin on Monday, July 4th from 6 to 9:30 pm. Docked at Sandestin’s Baytowne Marina, the 125 foot yacht will cruise into the sunset while you enjoy a cocktail and fresh coastal breezes from the sky deck. Then indulge in chef-prepared coastal cuisines featuring everything from Beef Filet Mignon and Fresh Rosemary Chicken to seared Gulf Fish, Southern Crab Cakes and Gulf Shrimp & Grits. Dance to live music and end the night with the best seat in the house as the sky above you illuminates with colorful fireworks. The SOLARIS also hosts Fireworks and Dinner cruises every Tuesday and Thursday from 7 – 10 p.m.Embark on the luxurious 125 yacht SOLARIS yacht for an unforgettable Fireworks and Dinner Cruise. Reservations required online or call 850.650.2519. It’s the most wonderful time of the year in Destin Fla – Crab Island Days are here! If you are planning a beach vacation to Destin Florida or wondering what the top things to do in Destin are, look no further than Crab Island. This majestic underwater sandbar is a water-lovers paradise and is only accessible by boat. The 45 ft SunVenture is one of the only Crab Island cruises available in Destin Florida. Forget the hassle of renting a boat to Crab Island – let our Coast-Guard licensed captains take you for a worry-free day on the water. Our entertaining captains will give you a narrated tour of the Destin Harbor as you enter the pass and go under the iconic Destin Bridge. Then we drop anchor into the waist-deep, emerald green waters as you enjoy fun in the sun. The boat and captains stay the entire time and there’s a restroom on board as well as snacks and drinks available for purchase. The sky’s the limit on what you can do at Crab Island. You’ll find a little bit of everything at Crab Island from floating bars, restaurants and platforms with live bands to people kayaking, snorkeling, paddle boarding or just relaxing on a float. Crab Island cruises occur twice a day at 10am and 2 pm as well as special holiday 4th of July Cruises and private cruises. View our daily Crab Island cruise schedule and book online here. See ya at Crab Island!